This article was originally posted at SAIFood. The lush tropical islands of the Hawaiian chain are an ideal place to grow fruit. Climate conditions that provide in excess of 100 inches of rain per year, an abundance of sunshine and ideal soil conditions, allow for the production of many delicious varieties of fruit. Papaya is the second most important Hawaiian fruit crop (pineapples are the first). In spite of ideal growing conditions, plant diseases are also present. Papaya ringspot virus was first detected in the 1940s and began affecting crop yields by the 1950s. By the late 1990s, papaya ringspot virus had affected every papaya producing region, resulting in production dropping by over 50% between 1993 and 2006. Such drastic circumstances led to cooperation between state government agriculture officials and the papaya producers in attempts to manage the spread (by aphids) of the virus. Part of this strategy was funding the Hawaii Department of Agriculture to develop a transgenic variety of papaya that would be resistant to papaya ringspot virus. This success story of one of the few public-sector developed GM crops in North America. The Hawaii Department of Agriculture began funding research into a genetically modified variety of papaya that would be resistant to the ringspot virus in 1985. By 1992, field trials had began to gather data about how successful the GM papaya would be in resisting the ringspot virus. The success of field trials led to the 1995 submission for regulatory approval to commercially produce GM papaya. American regulatory agencies approved GM papaya in 1998. Canadian regulatory agencies approved GM papaya for import in 2003. However, the key market for approval was the Japanese export market. GM papayas were submitted for Japanese regulatory approval in 1999, yet approval was not granted until 2011. Within two years of production approval, GM papaya accounted for over half of all the papaya production. Ten years later, GM papaya accounted for over 90% of papaya production. The success of GM papaya makes for a wonderful story, however it also highlights two crucial issues. The first is the message that Japanese regulators have sent to developing countries considering production of GM food crops. If it takes an industrial nation 12 years to approve the import of a GM food product then this will have a huge negative impact on crop production in developing countries. The second issue is that environmental opposition to GM crops affects the survival of papaya and the producers of those crops. Environmentalists opposed to GM crops and biotechnology have cut down papaya orchards on several occasions causing thousands of dollars in losses for farmers. 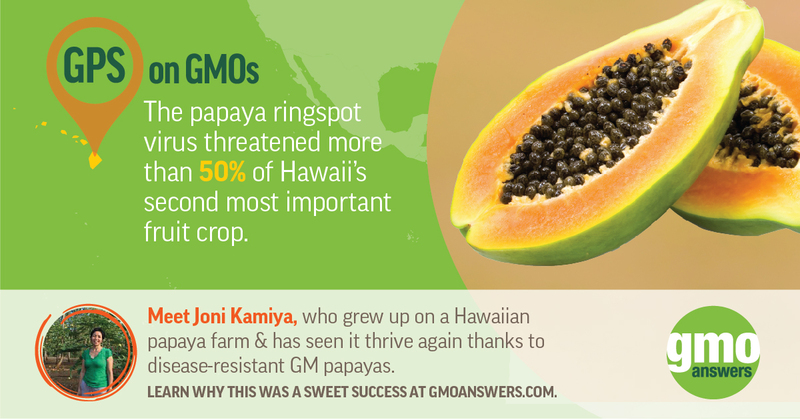 Without GM intervention, it would have led to the demise of Hawaii’s papaya production and exports. In the coming decade global food security needs to be meaningfully addressed, and to do so GM crops need to be one of the options available to subsistence farmers in developing countries. A fundamental question that needs to be asked of environmentalists is why are they opposed to improving global food security? Have time to watch a video? Watch Pamela Ronald’s TEDTalk: The case for engineering our food. @ 6:55 she discusses Papaya’s ringspot and the GM solution which is similar to the concept of vaccinating. Image: From APS: Gonsalves, D., S. Tripathi, J. B. Carr, and J. Y. Suzuki. 2010. Papaya Ringspot virus. The Plant Health Instructor.